Bowling Green, KY – The Bowling Green Hot Rods, Class A Affiliate of the Tampa Bay Rays, will add a special feature to their uniform for Saturday night’s game against the Fort Wayne TinCaps. To celebrate Independence Day, Hot Rods players and field staff will wear the 2010 Stars & Stripes Cap during the July 3rd contest at Bowling Green Ballpark. The ‘Stars & Stripes’ Cap program is designed to celebrate America’s birth while supporting Welcome Back Veterans, a program that addresses the needs of returning American Veterans and their families. “The Hot Rods are proud to be one of five Midwest League teams participating in the ‘Stars & Stripes’ cap program,” said Hot Rods GM and CEO Brad Taylor. “This is a great way to honor America and support a great program like ‘Welcome Back Veterans’”. 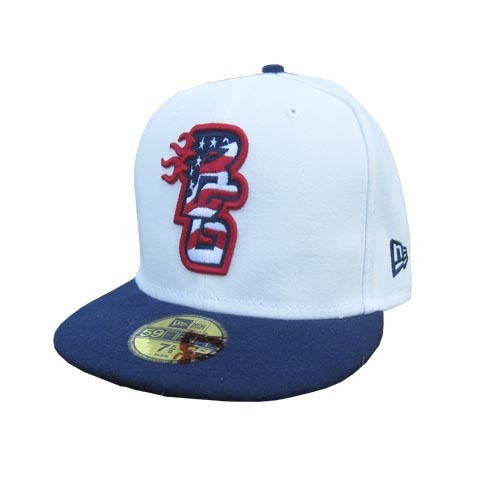 The Hot Rods are joining 71 other teams in all of Minor League Baseball wearing the Stars & Stripes cap this weekend. As part of the program, the Hot Rods and Major League Baseball Properties Inc., will donate all royalties from the sales of the caps to Welcome Back Veterans. Hot Rods fans can purchase their own limited edition cap at www.bghotrods.com or at The Body Shop at Bowling Green Ballpark. The caps were produced by the New Era Cap Co. and will have the American flag etched into the Hot Rods’ entwined ‘BG’ logo from their regular on-field caps. The Hot Rods continue their six-game home stand through Saturday night when the Hot Rods will wear the Stars & Stripes caps. The team will entertain fans with post-game fireworks on July 2 with another edition of the Family Fireworks series presented by Lawless Wiesemann Orthodontics, The Gables, Western Place, Clean Freaks, Home-Towne Suites, and WBKO. After Saturday night’s game on July 3, the Hot Rods will feature a special post-game fireworks show courtesy of Western Kentucky Orthopaedic & Neurosurgical Associates and State Farm. For tickets, visit www.bghotrods.com, call 270.901.2121, or head to the Ticket Office at Bowling Green Ballpark.